The Rohde-Schwarz AFG is available to buy refurbished used or rent, usually from our UK stock. Click here to download the Rohde-Schwarz AFG datasheet. 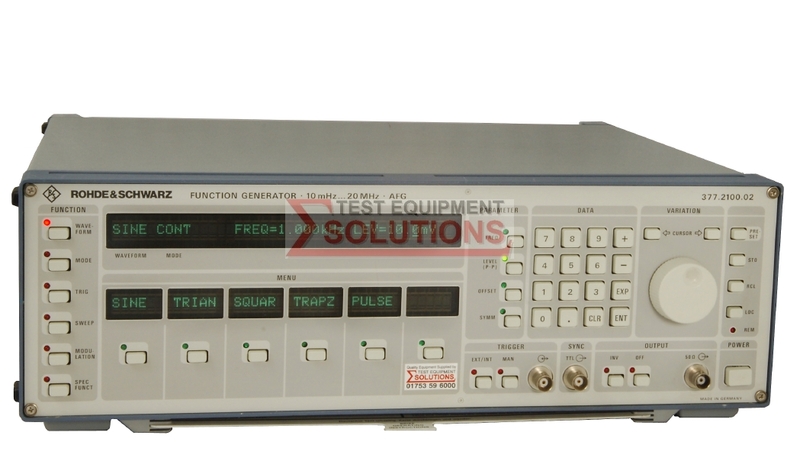 AFG and AFGU function generators provide practically all signals that are required in electronics, electroacoustics, vibration measurements, material testing and control engineering. Modulation modes include AM, FM, PM (pulse), FSK (frequency shift keying) and VCO operation. FSK and PM can be triggered internally or externally. AM and FM can be produced with the aid of external modulation signals. - 1uHz low frequency limit. - F/N and FxN mode. - Enhanced level range, selectable source impedance 5/50 ohm. We offer the refurbished used Rohde & Schwarz AFG 0.01Hz-20MHz Function Generator for sale and rental. The Rohde-Schwarz AFG is fully tested and refurbished in our in-house ISO9001 calibration laboratory. We supply manuals, accessories, full warranty and a free-of-charge Certificate of Conformity. We can also provide the Rohde-Schwarz AFG with a fresh calibration for a small additional charge. If you have under-utilised test equipment talk to us about trading-in or part-exchanging it towards the Rohde-Schwarz AFG or other refurbished test equipment.